Well done. Very well done. Though I must admit, I was not one of the ones who wanted Rebellion Story. To me, the show had its run and it ended how it ended. It wasn't perfect, but everything has its time and everything ends. Then I watched Rebellion Story, because… well, it existed. It turned everything against me and showed my favorite character's fall from grace and eventual rise as a goddess of destruction, a Nightmare to match the Dream Lord Madoka. To imprison her in a world of darkness, from which there may be no escape. Well done, Akemi Homura. All praises to our Dark Goddess Of Destruction. And yes, I think my statement regarding fanfiction replies to sequels as well–but even your statement that the ending “wasn't perfect” shows that there were things you wanted and didn't get, right? And yeah, as I mentioned in comments on a previous post, this movie elevated Homura from my favorite character in the series to one of my favorite characters in anything, ever. To put it another way, Rebellion trolls the entire audience, especially the fanbase. The part with Mami makes me thing of something you didn't bring up: the structure of Homura's encounters with each magical girl. She meets them in order from least to most hostile. So first there's Kyoko, where they show some kind of friendship, then Mami which eventually leads into a battle, and then Sayaka where Homura just tries to run away the first chance she gets. So when Homura runs into Madoka after seeing Sayaka, is she going from worst enemy to best friend, or from worse enemy to worst enemy? Because in a way, Madoka has always been Homura's enemy. 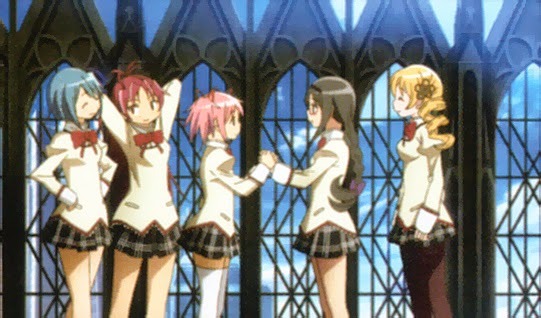 (And to cap it all off, Homura talks to Kyoko after the flower field scene, because all of Homura's life is a loop). I actually think the Mami-Homura fight has real significance to the film's narrative and themes, and largely because of something you said about the first few episodes. In the series, Mami is the representative and guardian of the magical girl narrative, whose death was necessary for the series to take its darker turn. In the first quarter of Rebellion, she again takes that role, as the girls' leader and even Homura's recruiter – Homura has finally been integrated into the narrative, and Mami is the one responsible. Mami and Homura didn't fight in the series because, for the most part, Homura never really opposed that narrative. She lurks around the sidelines, trying to keep Madoka out of it and making halfhearted attempts to keep Mami, Kyoko, and Sayaka alive and functional. But while she criticizes the magical girl narrative, she nonetheless accepts some form of it as inevitable and even necessary, embracing the task of destroying witches and making plans with Kyoko for who will protect the city if she ever succeeds in her struggle. In Rebellion, on the other hand, Homura's first act of rebellion is against the magical girl narrative itself. It just seems too good to be true to her, and as she investigates she becomes increasingly certain that she will – and must – destroy it. Which means when it's time for the curtain to rise and the film's true nature to be revealed, Mami is once again the false narrative's guardian – only this time, Homura is taking her on directly. Their conflict is the natural step for the story to take, with Mami as defender of the status quo and Homura as one who would force a change, for better or for worse. Of course, Homura loses that battle. And that, too, has thematic significance. The reason Homura loses is that she misidentifies identify her opponent – the Mami in front of her is a fake. But more importantly, Mami (let alone Bebe) isn't even the one she's truly opposing. Before Homura can ever win, she needs to know her enemy – the enemy she's been struggling against since she made her wish in the first place. One of the things the audience really wanted was to see Kyubey punished, and Rebellion gave that to us straight up. They got dunked and then they got owned, it was great. The fact that the movie ends more or less immediately after Kyubey's unambiguous defeat is highly significant in my Nutcracker reading. It's also a contrast between Madoka and Homura – Madoka approached the Incubator as a problem to be solved, Homura treated Kyubey as an enemy to be conquered. I believe the former reflects a more accurate understanding of the Incubator. It's my interpretation that it is a synthetic life designed by its society, given a single externally determined purpose which it pursues by any and every means available to it, and constrained by rules which it cannot break. An excellent thematic read of the movie. I plainly wasn't the one targeted for this film, since my read of Homura's was less ideal than a lot of people's at the end of the TV series, which, to me, was enough to justify a substantive sequel throughout as opposed to the subversive pandering that dominated a substantial portion of the movie. I still have some personal gripes, but these blog posts have come a long way in letting me appreciate Rebellion in what it was trying to do. And I feel that means I've done my job. I don't feel it's my place to tell you whether a work is good or bad or worth your time (though I don't shy from stating my opinion on these matters); my job is to provoke thought and discussion and reevaluation. So again, thank you.